Hemodialysis remains the most commonly used RRT option around the world. Technological advances, superior access to care, and better quality of care have led to overall improvement in survival of patients on long-term hemodialysis. Maintaining a functioning upper extremity vascular access for a prolonged duration continues to remain a challenge for dialysis providers. Frequently encountered difficulties in clinical practice include (1) a high incidence of central venous catheter–related central vein stenosis and (2) limited options for creating a functioning upper extremity permanent arteriovenous access. Lack of surgical skills, fear of complications, and limited involvement of the treating nephrologists in the decision-making process are some of the reasons why lower extremity permanent dialysis access remains an infrequently used option. Similar to upper extremity vascular access options, lower extremity arteriovenous fistula remains a preferred access over arteriovenous synthetic graft. The use of femoral tunneled catheter as a long-term access should be avoided as far as possible, especially with the availability of newer graft-catheter hybrid devices. Our review provides a summary of clinical evidence published in surgical, radiology, and nephrology literature highlighting the pros and cons of different types of lower extremity permanent dialysis access. Hemodialysis remains the most common modality of dialysis therapy for ESRD treatment worldwide (1). The advances in technology and improved process of care have led to longer survival of patients on dialysis. Long-term use of dialysis access along with multiple comorbidities, suboptimal blood vessel anatomy, and exhausted conventional access sites often result in difficulties in creating a suitable upper extremity arteriovenous access. A well functioning upper extremity arteriovenous fistula (AVF) remains an ideal vascular access because of its superior long–term patency and morbidity/mortality outcomes compared with a synthetic arteriovenous graft (AVG) or a tunneled central venous catheter (CVC). The guidelines from several national renal societies recommend (1) early evaluation of patients with CKD for an AVF placement and (2) avoidance of initiation of hemodialysis with a CVC to reduce morbidity, mortality, and health care costs. Moreover, multiple CVCs can cause potential loss of upper extremity access sites because of endothelial injury and central vein stenosis. Patients with ESRD who have exhausted upper extremity sites because of failed permanent vascular access placement are left with limited options to switch to peritoneal dialysis or explore and use optimal lower extremity vascular access (2). A lower extremity permanent dialysis vascular access (LE-PDVA) is often a reluctantly considered option for several reasons, including limited knowledge/familiarity amongst dialysis providers, inadequate information in nephrology literature, lack of available surgical expertise, fear of complications, and patient preferences. Several patient–related factors, such as peripheral arterial disease, diabetes, and morbid obesity, make planning and selecting an LE-PDVA site a challenging proposition and make femoral tunneled CVC an easy default solution. This review outlines available evidence on LE-PDVA in surgical and medical literature focused on establishing a permanent dialysis vascular access in patients who have exhausted upper extremity vascular access options. A femoral tunneled CVC may be considered as truly a last resort option after all potential sites for creating a permanent vascular access have been explored. An exteriorized silastic tubing was used to connect an artery and vein at the ankle by Quinton, Dillard, and Scribner in 1960. Frequent episodes of thrombosis, skin infections, and the need for multiple revisions were limiting factors encountered with this access (3). In 1970, George I. Thomas (4) designed the first lower extremity access that was successfully placed in the groin (Figure 1). Forty femoral arteriovenous shunts were implanted over a 2-year period between 1968 and 1970, and their 18-month follow-up experience was reported (4). Infection was a major concern reported in eight of the 40 patients, with Staphylococcus aureus being the predominant micro-organism. Two deaths were attributed to infection in this study. The Thomas shunt was well accepted by patients in a survey conducted, with minimal complaints regarding hindrance with bathing and clothing activities (4). Schematic representation of Thomas shunt. Freedman et al. (5) in 1992 reported 57 external Thomas femoral shunts placed in 43 patients over a 10-year period. Forty-two of these patients suffered from diabetes mellitus. The median shunt survival time was 28 months, and 63% remained functional at the end of the study or until death from unrelated causes. The remaining 37% of shunts failed after a mean duration of 18 months from thrombosis (57%), infections (24%), and failed surgical revisions (19%). The study showed conclusively that the presence of comorbidities, like diabetes, hypertension, or prior surgical access revisions, did not affect shunt survival time and that lower extremity vascular access provides a reasonable option when upper extremity access sites are unavailable (5). Thomas shunt was abandoned because of its associated high rate of infection and secondary hemorrhage. The LE-PDVA options are listed in Table 1 and include an autogenous AVF or a synthetic thigh AVG. 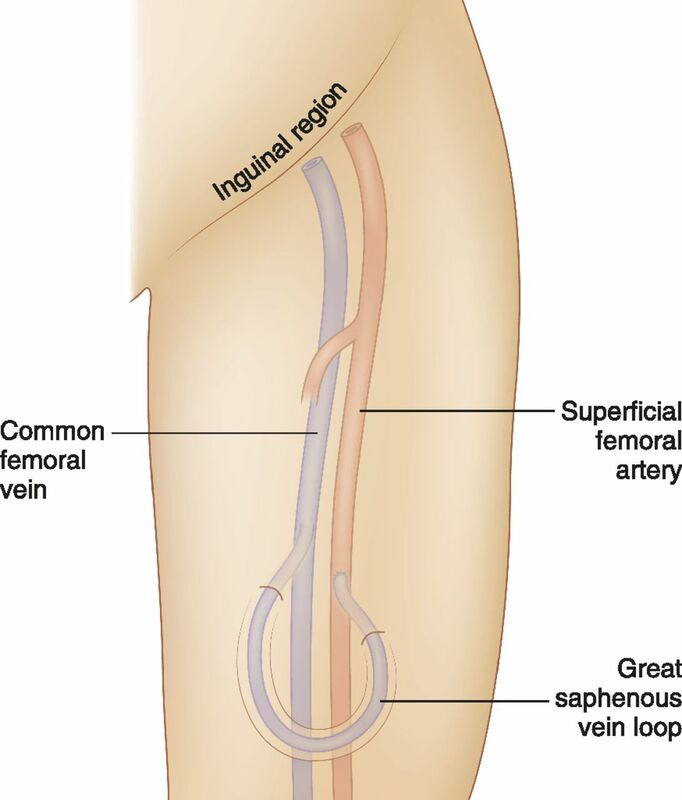 The types of autogenous lower extremity arteriovenous fistula (LE-AVF) include femoral vein transposition, femoral (superficial femoral) artery-great saphenous vein looped transposition, and posterior tibial artery-greater saphenous vein AVF. The synthetic lower extremity arteriovenous graft (LE-AVG) option includes upper thigh, midthigh, and saphenous vein loop grafts. Polytetrafluoroethylene (PTFE) grafts have been in use since the mid-1970s. The expanded polytetrafluoroethylene (ePTFE) and more recently, the heparin–bonded graft material are used successfully to create a dialysis vascular access. 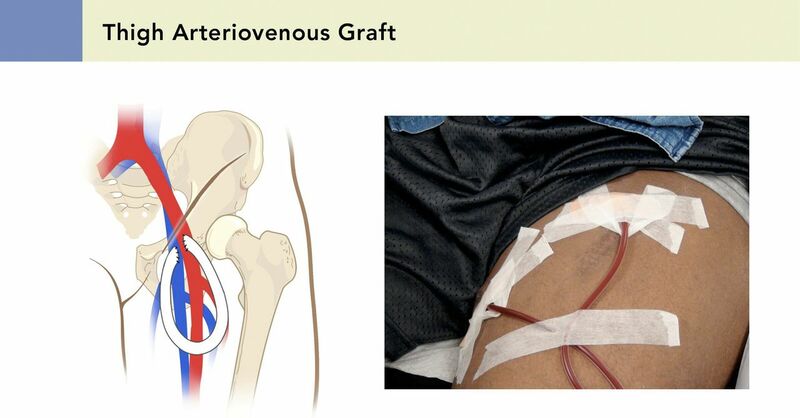 A 14-year retrospective study evaluating 35 patients with 37 femoral PTFE grafts showed that 27 (73%) grafts had no long-term complications, with median graft survival of 21 months and 5-year patency of 33%. The leading causes for graft loss were death, worsening claudication, foot amputation, graft thrombosis, and bacteremia (6). Cuffed ePTFE, a variation to conventional PTFE graft, was designed to reduce turbulence and shear stress by creating a large hood at the venous anastomosis (7). Gilbert and Gibbs (8) reported comparable patency and lower infection rates using cuffed ePTFE grafts in the midthigh region. Multilayered polyurethane graft, with its ability to self-seal and reduced time to hemostasis after decannulation, allows immediate use after surgery. Glickman et al. (9) reported 12-month primary and secondary patency rates between 78% and 85% compared with ePTFE grafts. Jefic et al. (10) reported 81% successful cannulation of polyurethane grafts within 4 days of surgery in 133 patients avoiding CVC placement. Compared with ePTFE, bovine mesenteric vein vascular bioprosthesis has lower patency rates because of higher incidence of venous anastomotic neointimal hyperplasia. The infection rate has been reported to be higher as well. Cryopreserved femoral vein has a lower incidence of thrombosis and reduced risk of steal syndrome and neointimal hyperplasia. It is often used to replace infected PTFE graft and salvage access site. However, the need for ABO compatibility and concern for antibody formation for future renal transplantation remain major disadvantages. Matsuura et al. (11) reported their experience with cryopreserved LE-AVGs (n=48). Thirty-eight of these were placed for infection, and 10 were placed for multiple graft failures. The graft patency was compared with that of upper extremity synthetic PTFE AVGs (n=68). The 1-year patency rates for LE-AVGs were 49% (primary) and 75% (secondary) versus those for upper extremity AVGs: 65% (primary) and 78% (secondary; P=0.52). The incidence of infection with cryopreserved femoral AVG remained zero, despite implantation in infected sites (11). However, Bolton et al. (12) reported 15% generalized and 40% localized complications in 20 patients who underwent cryopreserved femoral vein AVG placement in the thigh, upper extremity, or chest wall. Bolton et al. (12) concluded that cryopreserved femoral vein grafts carried a high risk for graft infection and rupture and recommended cryopreserved vein graft use only if other alternatives are unavailable. Most of the available data are from single–center observational studies. Center–specific selection bias of patient and/or type of vascular access makes it difficult to compare the evidence from these studies with that of others. The bias is further pronounced when dealing with patients who run out of conventional access sites. Superficial femoral or great saphenous vein is used to create an autogenous LE-PDVA. In 2000, Jackson (13) described a new vascular access procedure using transposed femoral vein to create an LE-AVF (Figure 2). Gradman et al. (14,15) reported a low thrombosis rate in 25 patients with transposed superficial femoral vein (tFV) AVF with mean follow-up of 9.1 months. The cumulative primary and secondary fistula patency rates were 78% and 73% at 6 and 12 months and 91% and 86% at 6 and 12 months, respectively. One patient needed above knee amputation for acute compartment syndrome, and eight patients required a second surgery for distal limb ischemia (14,15). Rueda et al. (16) reported 10 patients with tFV LE-AVF accesses, and none had a lower extremity ischemic event. Bourquelot et al. (17) reported secondary patency rates at 1 and 9 years of 84%±5% and 56%±9%, respectively, in 72 tFV created in 70 patients. A major concern encountered in these studies was infection at femoral vein harvest site and compartment syndrome, especially in patients with low ankle-brachial index, highlighting the importance of patient selection. 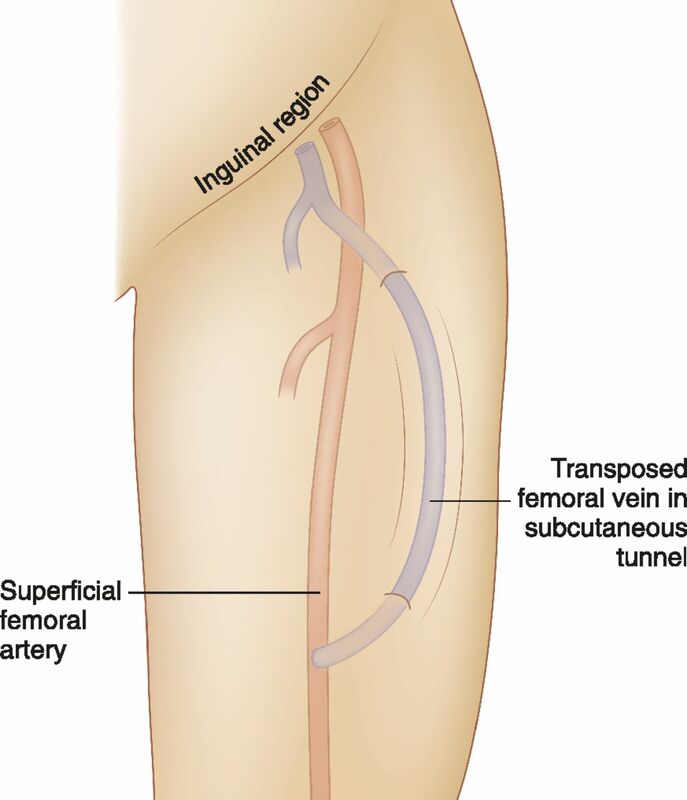 Schematic representation of transposed femoral vein to femoral artery lower extremity fistula. Initially described in 1969 by May et al. (18), this is rarely created now because of a high incidence of maturation failure secondary to neointimal hyperplasia (19) (Figure 3). Schematic representation of great saphenous vein looped arteriovenous fistula. LE-AVG can be considered when LE-AVF creation is not an option (Figure 4). Women and associated comorbidities, such as smoking, diabetes, and peripheral arterial disease, can affect thrombosis, long-term patency, and peripheral ischemic complications (20,21). The incidence of lower extremity ischemia after LE-AVG placement is higher when ankle-brachial index is <0.80. On average, 2.4 procedures per patient are required to place and maintain LE-AVG access (22). Cull et al. (23) report 1.68 interventions per year to maintain LE-AVG patency, which is significantly influenced by body mass index. Hazinedaroğlu et al. (24) reported 86.7% 1-year patency with LE-AVF compared with 37.5% for LE-AVGs, with fewer rates of infective complications. Schematic representation of a thigh arteriovenous graft. Reprinted from the Atlas of Dialysis Vascular Access (www.esrdncc.org), with permission. A retrospective, single–center study over 8 years evaluating 1700 consecutive vascular accesses (58.7% AVF and 41.3% AVG) reported similar patency rates between AVFs and AVGs, irrespective of location (upper arm, forearm, or thigh). Infection and thrombosis rates were higher with AVG compared with AVF; however, access salvage after a thrombotic event was superior with AVG (25). Table 2 provides the outcome data from various studies that evaluated LE-AVG as permanent dialysis vascular access. The primary and secondary patency rates for LE-AVG have been reported as 34%–62% and 41%–83%, respectively (22,26,27), and infection rate up to 46% (27). Geenen et al. (28) reported a 27% infection rate in the largest reported series of 153 LE-AVGs. In a longitudinal follow-up of 268 accesses over 8 years, Ram et al. (21) reported that thigh AVGs survived longer than upper arm AVGs and upper arm AVFs (47% versus 11% and 3% at 5 years, respectively; P<0.01), adding significant survival time on dialysis and longevity for these patients. A loop midthigh AVG is a variation of a thigh AVG, and it is created by anastomosing the PTFE loop to the midsuperficial femoral artery and vein, preserving the proximal femoral vessels for future graft revision. A midthigh location avoids the lymph node–bearing tissue and overhanging panniculus of the groin, provides easy access for cannulation, and lowers the risk for infection. Results indicate that a midthigh loop is superior to a thigh loop in terms of patency and survival time and should be considered before placement of a thigh loop AVF (29). Miller et al. (30) reported a lower infection rate of 0.13 per patient-year with LE-AVG compared with 0.7–2.0 per patient-year (2.0–5.5 per 1000 patient-days with femoral vein tunneled cuffed catheter [FV-CVC]). The LE-AVG thrombosis rate of 1.58 per patient-year is lower compared with 3.0–3.2 per patient-year (8.1–8.8 per 1000 patient-days) with FV-CVC. The cumulative survival rate at 1 year for LE-AVG was 62%, substantially higher than 9% for FV-CVC (30). Patients with exhausted upper extremity PDVA sites often become dependent on CVC. A prospective database review comparing 472 internal jugular CVCs with 209 LE-AVGs showed 2-year secondary patency rates of 27% and 54%, respectively. Secondary survival was much worse for dialysis catheters than for LE-AVGs (hazard ratio, 4.44; 95% confidence interval, 3.65 to 5.22; P<0.001). Also, 1-year cumulative risk of access-related bacteremia was considerably higher: 79% with internal jugular CVC compared with 21% with LE-AVG (31). Hemodialysis Reliable Outflow (HeRO) device (Hemosphere Inc., Minneapolis, MN) placement can be considered in patients with central venous stenosis or occlusion that precludes conventional upper extremity PDVA. However, insertion of an HeRO device is relatively contraindicated for brachial artery diameter <3 mm, congestive heart failure with ejection fraction <20%, active infection, and/or systolic BP <100 mmHg. In these circumstances, LE-PDVA could still be placed and used for hemodialysis (32). Katzman et al. (33) reported the HeRO device to have lower rates of bacteremia in comparison with CVC and similar function and patency compared with conventional AVG. Gage et al. (34) reported secondary patency in 164 patients with the HeRO device of 86.7%, with an intervention rate of 1.5 per year and an access–related infection rate of 0.14/1000 implant days (similar to standard AVGs and superior to CVC in terms of patency, intervention, and infection rates). Steerman et al. (35) compared outcomes of 60 HeRO devices in 59 patients and 22 LE-AVGs in 21 patients during mean follow-up of 13.9 months for the HeRO group and 11.9 months for the LE-AVG group. The number of interventions to maintain patency was 2.21 per year in the HeRO group and 1.17 per year in the LE-AVG group (P=0.003). Secondary patency at 6 months was 77% for the HeRO group and 83% for the LE-AVG group (P=0.14). The HeRO and LE-AVG groups did not differ significantly in their infection rate per 1000 days (0.61 versus 0.71, respectively; P=0.77) or mortality rate (22% versus 19%, respectively; P=0.22) at 6 months (35). The thrombectomy procedure in an HeRO device is performed similar to that performed for a standard AVG, with intragraft stenosis as the most common encountered pathology. The risk of developing clinically significant pulmonary embolism during the thrombectomy procedure in a thrombosed HeRO device is higher compared with that in conventional arteriovenous access because of larger clot burden. Kudlaty et al. (36) compared LE-AVG with the HeRO device and found 1- and 2-year secondary patency rates to be similar in both groups but with higher need for intervention in the HeRO group (1.1 versus 1.65, respectively) to maintain patency. The infectious complication in the LE-AVG group was higher compared with that in the HeRO group (29% versus 15%, respectively). The incidence of ischemia steal syndrome has also been reported to be high with the HeRO device (37). The choice between the HeRO device and LE-AVG remains unclear in the literature, and the authors believe that the selection should be based on the availability of surgical and interventional expertise, patient habitus (morbidity and peripheral vascular disease), and patient preference. There is no nationwide data available on the use of FV-CVC as permanent dialysis vascular access. Table 3 provides various studies that evaluated the safety and efficacy of FV-CVC in comparison to other accesses. Most of these are small retrospective studies reporting experiences from a single center. Chow et al. (38), in their preliminary data on safety and efficacy of FV-CVC in a small group of patients, reported achieving prescribed blood flow rates with statistically nonsignificant higher rates of infections and shorter median access survival in comparison to LE-AVGs. Infection rates with FV-CVC are also reported to be comparable with those seen with jugular CVC (38). Falk (39) reported a significantly lower patency rate (44% at 1 month) with FV-CVCs, with a catheter–related infection rate of 6.3/1000 catheter days and poor blood flows requiring 1–13 interventions. The risk for iliac vein occlusion and ipsilateral deep vein thrombosis necessitates avoiding FV-CVC in potential transplant recipients (39–41). Burton et al. (41) found that advanced age, diabetes, and left femoral vein insertion site predispose to a higher catheter failure rate. Higher mortality rates have been reported with FV-CVC compared with lower extremity synthetic AVG (28.1% versus 1.5%, respectively) (42). FV-CVC should remain an absolute last resort option as an LE-PDVA. Selecting an LE-PDVA becomes challenging and requires a thorough understanding of the available scientific data. The clinical evidence is limited, biased, and spread out in surgery, nephrology, and radiology literature, making it harder to assimilate and adequately modify our clinical practice. The algorithm in Figure 5 may be beneficial in clinical practice when considering lower extremity access options. The broad conclusions drawn by the authors after this review are listed below. 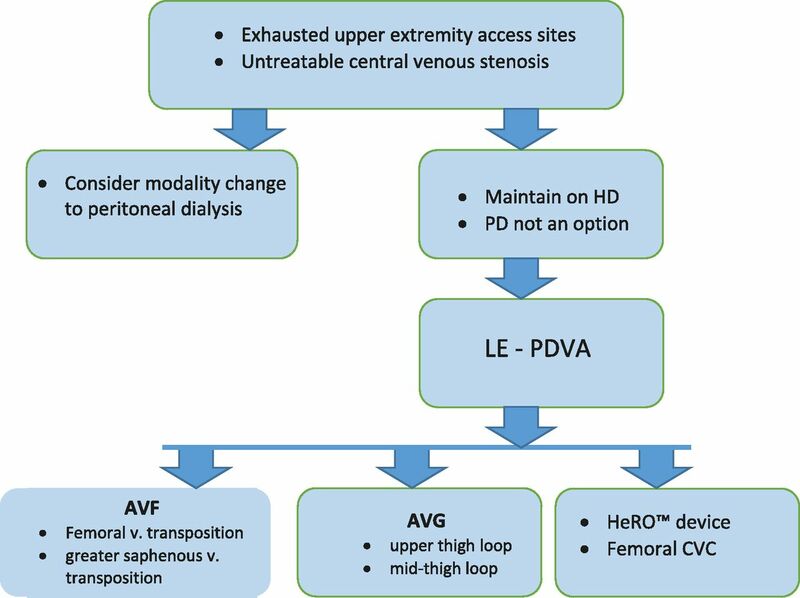 Clinical decision–making algorithm for lower extremity permanent dialysis vascular access (LE-PDVA). AVF, arteriovenous fistula; AVG, arteriovenous graft; CVC, central venous catheter; HD, hemodialysis; HeRO, Hemodialysis Reliable Outflow; PD, peritoneal dialysis. (1) Consider evaluating all patients without an option for upper extremity permanent dialysis vascular access for LE-PDVA. (2) Patient selection is critical before creating an LE-PDVA; evaluate lower extremity circulation with ankle-brachial index study. (3) LE-AVF or LE-AVG is the preferred LE-PDVA option in selected patient populations over FV-CVC. (4) LE-AVF must be considered as the first choice of LE-PDVA followed by LE-AVG. (5) Selection between the HeRO device and LE-AVG remains an individualized decision. (6) FV-CVC use as a permanent dialysis vascular access remains an absolute last resort. Early planning and preservation of vessels for dialysis vascular access creation can assist in creating an ideal access in the upper extremity. Unfortunately, real life situations may be less than ideal. Moreover, improving survival on dialysis to outlive the conventional dialysis access options, advancing age of the dialysis population, multiple comorbidities, and multiple access failures often bring the dialysis providers to crossroads for selecting and creating the next best vascular access with acceptable patency rates and minimal complications. There remains a huge gap in our understanding of the actual need for lower extremity access because of the lack of large databases collecting this critical information. The current knowledge is mainly compiled from single-center experiences and retrospective studies. This review highlights the need for a randomized, multicentered clinical trial in access–challenged patient populations to determine the best long–term LE-PDVA option.